What is one of the basic elements of a successful scrapbook layout? Clearly, there are several correct answers to this question. Color, journaling, photos… Another element that can’t be forgotten is design. Without a solid design, these other elements wouldn’t have a foundation on which to come together. I read Jim Krause's Photo Idea Index years ago and enjoyed it. With the recent lack of specifically scrapbooking-based design idea books, I thought it might be time to expand my horizon for knowledge and inspiration once again. So, I picked up Krause's Design Basics Index. While some concepts were familiar to me, just as many were new and enlightening. He'll often recognize a design obstacle and then present you with ways to avoid or correct it. Also, Krause's delivery is understandable and engaging. To showcase this, I will share some of my favorite quotes from each section below. Also, Krause illustrates his topics extensively with examples, so if you're ever unsure of what he's trying to express in words, he'll have multiple visual representations as well. One thing that I especially appreciate is that he will often not only offer a visual on the 'right' way, but also the 'wrong' way so that you can truly see the difference using an element correctly can make. 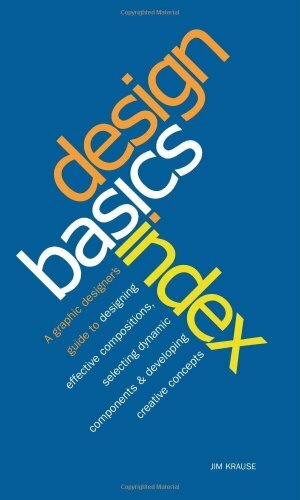 First, he divides the contents of the book into The Three C's of Design - Composition, Components, & Concept. Krause covers elements such as placement and divisions, grouping, harmony, emphasis, alignment and flow. "Every layout begins as empty space. When we add a visual element to that space, its success or failure as a carrier of the piece's message depends on three factors: the quality of the component, its relevance, and its relationship to other elements in the design. The placement of elements within a composition determines the spatial relationships between those elements and gives the viewer clues for determining their relevance and significance within the layout." "Harmony means agreement. Visual harmony means agreement between elements, both aesthetically and thematically. This kind of harmony can be achieved through the intentional repetition of elements...and through echoes of theme, color and style." "Emphasis is a lot like coals in a campfire-when the embers are collected into a pile, their concentrated heat can ignite a log in seconds. Spread thin, their energy can barely warm a pair of cold hands." "Just as a person might feel uncomfortable in a confined space, the eye also feels uneasy when it finds itself presented with no way out. Many viewers, when confronted with trapped visual space, feel a distinct, though difficult to define, sense of unease." In this section, Krause covers shapes, icons, supporting elements, images, color and typography. "Every viewer of a photo or illustration sees that image differently. An image that is likely to catch and hold a particular viewer's attention is one that possesses at least one of the following qualities: content that is informative or relevant; content that is intriguing or worthy of further investigation; content that is aesthetically or emotionally appealing. Given one or more of these qualities, there is yet another critical consideration to take into account regarding the ultimate success or failure of an image in reaching its audience: presentation." "Creating harmonious and effective combinations of color is a matter of instinct (honed through practice and observation), awareness of trends, and understanding of color theory basics." "Typefaces give voice to words." "A musical duet or trio that is made up of different instruments is able to achieve a quality of sound that could not be replicated if all of the instruments were the same. Similarly, when fonts from different families are combined in a logo, layout, or publication, an interaction occurs that can deepen and enrich the composition." This section is made up of three main topics - conveyance, theme, and the creative process. "Concept is King. Concept is also Queen, Court Jester, Czar, Prime Minister, Head Honcho and the Big Kahuna. Concept is abstract, intangible and untouchable-and yet, without its binding influence, the elements of a design fall from the page and land in the gutter." "Theme is the envelope in which concept is sent. Theme is the tone of a piece, its emotional appeal (or lack thereof), its style of presentation...Theme is a powerful and influential force that speaks to the viewer on both conscious and subconscious levels." "There is no neutral state when it comes to creativity....Observation, study, practice and play are all essential elements of creative growth. Each has to do with expanding our creativity through either nourishment or exercise." Another great element about this book is that there are also exercises scattered throughout the book to help you explore and experiment with the principles discussed in the book in a very hands-on way. Applying the concepts and techniques only helps you to better implement them in your next scrapbook design. While not written specifically with scrapbooking in mind, design is design. There is no denying that there is much to be learned in this book for any scrapbooker who wishes to improve their own knowledge and understanding of good design. 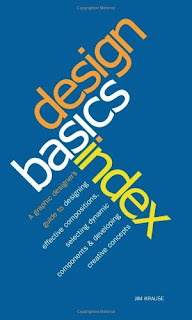 If this sounds like you, adding Design Basics Index by Jim Krause to your bookshelf would be a very wise choice! Have you read this book or any others by Jim Krause? Did you find them useful to you in the realm of scrapbooking? What other non-scrapbooking specific design books have you read and enjoyed?